Bob was born in Bellingham, Wash., to Minnie and Michael Burns on July 23, 1924. He graduated from Bellingham High School and was drafted immediately into the Army field artillery. Hearing that the Air Force was recruiting, he applied and was accepted as an Air Force cadet and graduated as a second lieutenant fighter pilot. They needed bomber pilots, however, so the Air Force sent him to school to become certified to fly B-17s in the European theatre. Just as his squadron was ready to leave for Europe, he was sent to fly the B-29 and fight in the Pacific. As he finished training, World War II came to an end, and so, too, his days as an Air Force pilot. After the war, Bob returned to Bellingham to begin his entrepreneurial business career as owner of the city's premier retail clothing store, which included a ski shop for the local skiing enthusiast enjoying the deep powder of Mt. Baker. From a successful retail clothing business, he went on to become the father of the resort time-share industry in North America and co-founded Vacation Internationale in 1974, which became the business model for all the major hospitality and hotel companies that eventually dominated the industry in the early 1990s. He was also the inspiration and initial backer of Sun Valley's first fractional ownership resort—Les Saisons. His customer-driven philosophies for marketing and selling are still the envy and benchmark for the entire shared-ownership industry. 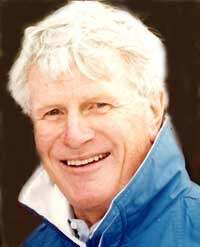 Throughout his life, Bob was an avid and passionate skier, and he was still skiing Mt. Baldy in Sun Valley, top to bottom, in his early 80s. He and his loving wife, Jeannine, were the consummate outdoor enthusiasts who enjoyed all forms of skiing in the winter and sailing, tennis and golf in the summer. He started skiing in Sun Valley in 1946 and never missed an opportunity to be the first on the lift to make first tracks after a big snowfall. He believed that "all you give is all you get, so give it all you've got," and with everything in life, he did so without question. Sun Valley, Idaho, was home for the past 14 years, where he died peacefully at the age of 87. He is remembered with inspiration and love by Jeannine, his dear wife of 33 years; his seven children, Pat, Michael, Mollie, Katie, Brian, Brad and Kim; and his 24 grandchildren, ranging in age from 10 to 26. Remembrances in his name can be made to Junior Achievement of Washington and Hospice of the Wood River Valley. A memorial celebration for friends and family will be held at the Presbyterian Church of the Big Wood in Ketchum, Idaho, on Friday, Sept. 9, at 2 p.m.